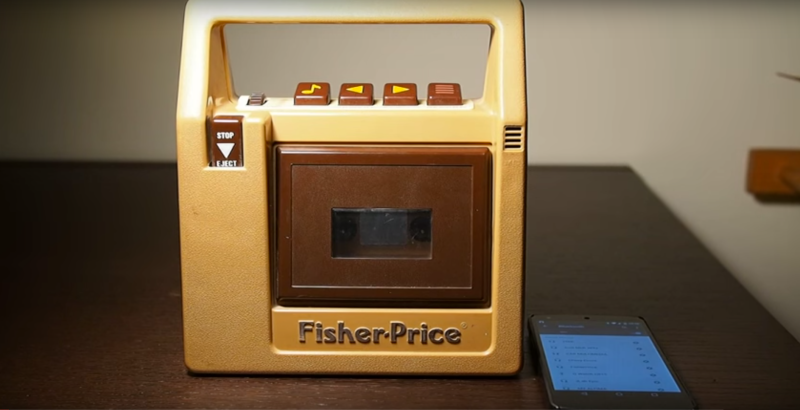 Some Wonderful Soul converted a Fisher-Price Cassette Player into a Bluetooth Speaker! Should you be fortunate enough to still have one of your old Fisher Price cassette player — found it alongside your Pocket Rockers, slap bracelets and Benneton sweaters — you’ll no longer have to look at your beloved personal electronic “stereo” as a technological fossil. You can thank Matt Gruskin for giving the device a second look — and a second life — as a retro-styled Bluetooth speaker. [Matt] selected an off the shelf Bluetooth module and another ready-to-go audio amplifier board. He built a custom board to convert the stereo output to mono and hold the rotary encoder he used for the volume control. An Arduino (what else?) reads the encoder and also provides 3.3V to some of the other electronics. These types of DIY projects never cease to amaze me and put a smile on my face. So, Matt Gruskin, thank you for bringing an awesome sliver of our childhoods into the modern tech era. Next Next post: Don’t Forget to Play ‘Kung Fury’ on PS4!